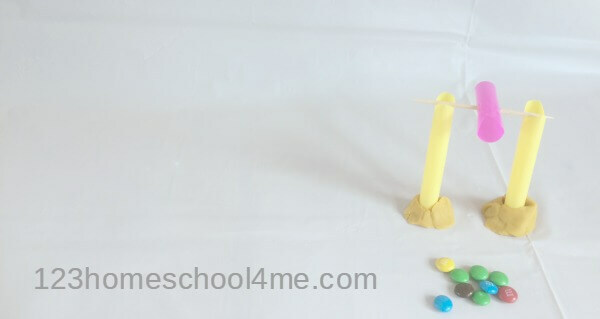 Candy is always a fun way to learn STEM. 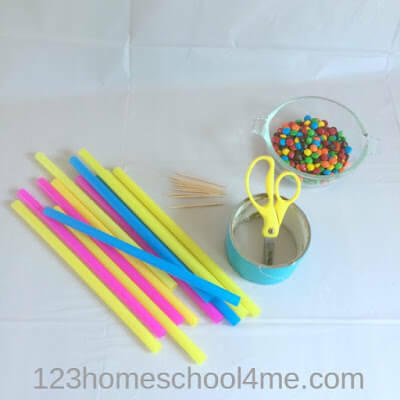 This Candy and Simple Machine Science Project uses simple machines project presents a great way to talk about the transition between potential energy and kinetic energy as well as practice some engineering skills. 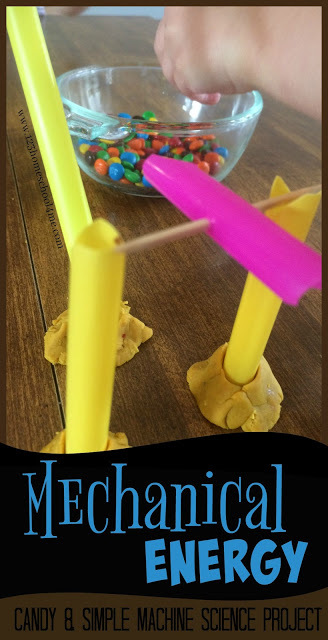 Kids of all ages will love this mechanical energy activity! One of my daughters has been begging to learn more science lately. She and all of siblings spent most of an hour watching M and M’s go down the slide and turn the fly wheel. While they played we talked about the physics involved. Kinetic energy is the energy of motion. 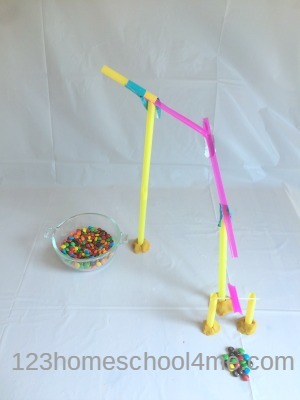 As the candy slides down the shoot, it gains more and more speed. The more speed it gains the more kinetic energy it has. Where does the mechanical energy go? This was easy. At the bottom of the slide, or inclined plane the M and M transfer’s it’s mechanical energy to the flywheel, a type of lever. Both inclined plans and levers are a type of simple machine. Simple machines are devices that change the direction or the magnitude (size) of a force. How did these machines change the force? The inclined planes changed the direction from straight toward the center of the earth to a path that was more parallel. The fly wheel lever actually changed the direction from straight down to a circle- angular motion! To build your fly wheel, cut two lengths of straw about 10 cm high. Notch the top ends, and secure the bottom ends in the play dough. Cut another piece about 5 cm long and cut out a piece on each end as shown. Then push a tooth pic through the center. Suspend this from the longer straws by the tooth pic. 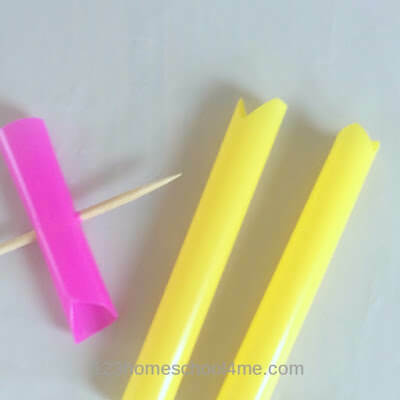 Create the slides for your candy by cutting the straws in half. Cut a straw just a little taller than your flywheel and notch the top to fit the half straw onto it. Experiment with making sure the candy will hit the flywheel as it comes off before taping it together. From there, you can make any combination of slides that interests you. 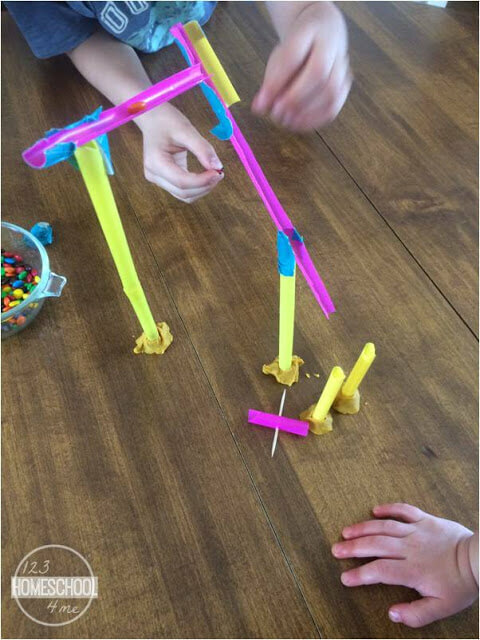 If your child enjoys these types of toys, you may want to check out Paul Hewitt’s Conceptual Physics. It’s meant to be used as a text book, but is written so well that we tend it to pick it up for pleasure reading. Hewitt uses humor and every day examples to make physics accessible to anyone. Don’t be fooled. Physics is not a difficult science because there is so much to learn. There is very little to know. The important thing is that your children learn the skills of applying a few simple concepts in a variety of situations. As they do, they’ll begin to see the amazing complexity of the world all around them, just like my kids did with this candy machine.